Parker's one piece integral connectors allow the user to switch from piping flange standards to instrument compression with minimum cost and added safety. This system eliminates the need for additional connections. Parker’s Flange to Tube Fitting Adapter is designed as a one piece, leak free connection for process, power, and instrumentation applications where both flanges and tube fittings are used. These adapters utilize a ANSI Flange connection on one side and a tube fitting connection on the other side. These offer easy make-up and excellent performance in tight, multi-connection applications. 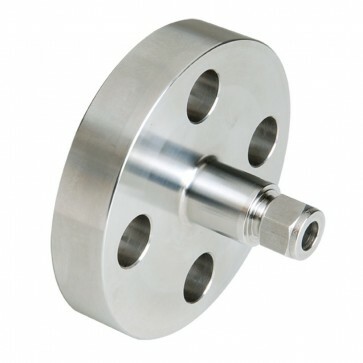 These Flange Adapters are manufactured from heat code traceable 316 stainless steel. Other materials include 6Mo, Alloy 825, Alloy 625 and Alloy C-276. The tube fittings are gaugeable and manufactured to the highest industry quality standards. Flange Size (inch) 1/2", 3/4", 1", 1-1/2", 2"